The shikimate pathway is the biosynthetic pathway by which the aromatic amino acids [C Abell book chapter in "Comprehensive Natural Products Chemistry - Vol. 1", ed. U Sankawa, 1999, Elsevier, Amsterdam, pp 573-607, ISBN: 0080431534 (v.1)], phenylalanine, tyrosine and tryptophan are assembled. The pathway is present in plants, microorganisms and fungi but not mammals. It is the target for Glyphosate, a very important herbicide. Our interests were to understand the enzymology of the pathway and we used detailed knowledge of the mechanism and structure of specific enzymes to design novel enzyme inhibitors. Such compounds could potentially be herbicides, fungicides, antibiotics or antiparasitic agents. We have previously shown that (6R)- and (6S)-6-fluoroEPSPs are potent inhibitors of chorismate synthase. Incubation of (6R)-6-fluoroEPSP with chorismate synthase provided the first evidence for the novel radical mechanism used by this enzyme while (6S)-6-fluoroEPSP is slowly converted into 2-fluorochorismate. We subsequently showed that 2-fluorochorismate irreversibly inhibited PabB by modifying the active site residue Lys274. This was a key piece of evidence in the discovery of the mechanism of this enzyme. We were the first group to detect an unprecedented covalent intermediate. 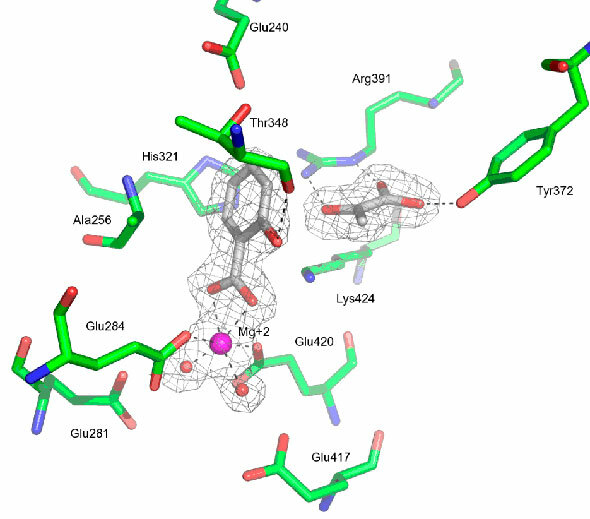 We have characterised the first salicylate synthase, Irp9 from Yersinia. We solved the X-ray crystal structure with and without the product bound and studied the relationship to the structurally homologous enzyme TrpE. Based on their close structural similarity we have used site directed mutagenesis to convert Irp9 into an anthranilate synthase. Dehydroquinase catalyses the dehydration of dehydroquinate to form dehydroshikimate. The type I enzyme involves an imine intermediate and catalyses a syn elimination with loss of the equatorial C-2 hydrogen. The mechanism of the type II enzyme proceeds through an enolate and involves loss of the axial hydrogen at C-2 in an anti elimination. On the basis of these mechanistic differences we designed first generation inhibitors that are specific to type I and type II enzymes. Insights into the structure of type II dehydroquinase have led to a new strategy for developing potent inhibitors of the enzyme. Observation of a secondary tritium isotope effect in the chorismate synthase reaction. Irreversible inhibition of type I dehydroquinase by substrates for type II dehydroquinase. Detection of covalent intermediates formed in the reaction of 4-amino-4-deoxychorismate synthase. Evidence from kinetic isotope studies for an enolate intermediate in the mechanism of type II dehydroquinases. pH-tuneable binding of 2'-phospho-ADP-ribose to ketopantoate reductase: a structural and calorimetric study.